Ketoconazole, a synthetic imidazole derivative, is an azole antifungal agent. Ketoconazole is administered orally. To ensure absorption in patients with achlorhydria, it has been recommended that each 200 mg of ketoconazole be dissolved in 4 mL of 0.2N hydrochloric acid solution or taken with 200 mL of 0.1N hydrochloric acid. The resultant solution should be administered via a plastic or glass straw to avoid contact with the teeth, and a glass of water should be administered immediately after the solution. Alternatively, some clinicians have recommended that each 200 mg of ketoconazole be given with 680 mg or more of glutamic acid hydrochloride. Other clinicians have suggested that each 200 mg of ketoconazole can be administered with an acidic beverage (e.g., Coca-Cola®, Pepsi®) or the dose can be dissolved in 60 mL of citrus juice to ensure absorption; however, this strategy may not be adequate in all patients with achlorhydria and patients should be monitored closely for therapeutic failure. The usual initial adult dosage of ketoconazole recommended by the manufacturer is 200 mg once daily. For severe infections or if the expected clinical response is not achieved, the manufacturer states that the dosage may be increased to 400 mg once daily. Although data are limited regarding use of ketoconazole in children, children older than 2 years of age have received a dosage of 3.3-6.6 mg/kg once daily; dosage has not been established for younger children. For the treatment of blastomycosis, coccidioidomycosis, or histoplasmosis, some clinicians recommend that ketoconazole be administered in a dosage of 400 mg once or twice daily. A dosage of 200 mg once or twice daily also has been used for the treatment of histoplasmosis. A dosage of 200-400 mg daily has been recommended for the treatment of chromomycosis, paracoccidioidomycosis, or oropharyngeal and esophageal candidiasis. For the treatment of uncomplicated vulvovaginal candidiasis in nonpregnant women, ketoconazole has been given in a dosage of 200-400 mg twice daily for 5 days. When used as a maintenance regimen to reduce the frequency of recurrent episodes of vulvovaginal candidiasis in women who have received an initial intensive antifungal regimen (i.e., 7-14 days of an intravaginal azole antifungal or a 2-dose fluconazole regimen), ketoconazole has been given in a dosage of 100 mg once daily for up to 6 months. The duration of ketoconazole therapy depends on the infecting organism and the site and severity of the infection. Generally, therapy should be continued until clinical and mycologic tests indicate that the fungal infection has subsided. The usual duration of therapy for the treatment of candidiasis (including oral infections and candiduria) is 1-4 weeks, and the usual duration of therapy for chronic mucocutaneous candidiasis is 6-12 months. Maintenance therapy may be necessary for the treatment of chronic mucocutaneous candidiasis. Prolonged therapy also may be needed for the treatment of chronic oral candidiasis, such as that associated with severe chronic xerostomia secondary to head and neck radiation therapy. The manufacturer states that paracoccidioidomycosis and histoplasmosis usually require a minimum of 6 months of therapy; however, 2-6 months of therapy have been effective in some patients. Coccidioidomycosis, chromomycosis, and blastomycosis usually require 6-12 months of therapy. Dermatophytoses have been successfully treated with 200-400 mg of ketoconazole daily for 1-2 months; however, tinea unguium (onychomycosis) may require at least 6-12 months of therapy. For the treatment of cutaneous or mucocutaneous leishmaniasis or visceral leishmaniasis (kala-azar), a ketoconazole dosage of 400-600 mg daily for 4-8 weeks has been used. For the treatment of prostatic carcinoma or as an adjunct in the management of disseminated intravascular coagulation (DIC) associated with prostatic carcinoma, a ketoconazole dosage of 400 mg every 8 hours has been used; however, the risk of depressed adrenocortical function at this high dosage should be considered. Because gastric acidity is necessary for the dissolution and absorption of ketoconazole, concomitant administration of drugs which decrease gastric acid output or increase gastric pH (e.g., antacids, cimetidine, ranitidine, antimuscarinics) may decrease absorption of the antifungal agent. In one study, administration of oral cimetidine 2 hours prior to administration of ketoconazole had no effect on absorption of ketoconazole when the antifungal agent was administered as an acidified solution. In another study in healthy adults, concomitant administration of a single 400-mg oral dose of ketoconazole within 2 hours of an oral ranitidine 150-mg dose was associated with a reduction in ketoconazole bioavailability of approximately 95%; ranitidine had been administered in a dosage of 150 mg every 12 hours for 2 days prior to administration of ketoconazole. Absorption of ketoconazole also appears to be reduced (e.g., by about 20%) by concomitant sucralfate administration; however, such reduced bioavailability of the drug does not appear to result from an elevation in gastric pH. If concomitant therapy with drugs that affect gastric acidity or with sucralfate is necessary during ketoconazole therapy, these drugs should be given at least 2 hours after ketoconazole tablets. Because ketoconazole can cause severe hepatotoxicity, patients receiving the antifungal agent concurrently with other potentially hepatotoxic drugs should be carefully monitored, especially those requiring prolonged therapy or with a history of liver disease. Concomitant administration of ketoconazole and rifampin has resulted in decreased serum concentrations of ketoconazole, and the manufacturer of ketoconazole recommends that the drugs not be administered concomitantly. In one patient receiving ketoconazole concomitantly with rifampin and isoniazid, serum concentrations of both rifampin and ketoconazole were decreased. Although administration of ketoconazole 12 hours after the rifampin dose resulted in therapeutic serum concentrations of rifampin, serum concentrations of ketoconazole were subtherapeutic regardless of when the doses were given. In addition, isoniazid and rifampin appeared to have an additive effect in reducing serum ketoconazole concentrations. The clinical importance has not been determined, but ketoconazole and acyclovir have shown dose-dependent, synergistic, antiviral activity against herpes simplex virus types 1 and 2 (HSV-1 and -2) in in vitro replication studies. The combination of ketoconazole and vidarabine showed interference, indifference, or antagonism in vitro against these viruses. Norfloxacin may enhance the antifungal activity of antifungal agents (e.g., amphotericin B, flucytosine, ketoconazole, nystatin). There are conflicting reports on this interaction, however, and in at least one in vitro study norfloxacin had no effect on the antifungal activity of amphotericin B. Further study is needed to evaluate the antifungal effect when norfloxacin is used in conjunction with an antifungal agent. Concomitant administration of ketoconazole and cisapride is contraindicated. Ketoconazole appears to inhibit metabolism of cisapride. Concomitant use of ketoconazole and cisapride has resulted in markedly elevated cisapride plasma concentrations and a prolonged QT interval and has rarely resulted in serious cardiovascular effects, including ventricular tachycardia, ventricular fibrillation, and torsades de pointes. Like other imidazole derivatives, ketoconazole may enhance the anticoagulant effect of coumarin drugs. When ketoconazole is used concomitantly with these drugs, the anticoagulant effect should be carefully monitored and dosage of the anticoagulant adjusted accordingly. Concomitant administration of ketoconazole and cyclosporine has been reported to increase plasma concentrations of cyclosporine and serum creatinine concentrations. It has been suggested that ketoconazole may interfere with the metabolism of cyclosporine via hepatic microsomal enzyme inhibition, although other mechanisms may also be involved. When ketoconazole therapy is initiated in patients receiving cyclosporine, renal function and blood or plasma cyclosporine concentrations should be monitored; some clinicians also recommend that reduction in cyclosporine dosage or replacement of cyclosporine with another immunosuppressive agent be considered. Patients stabilized on both drugs may require an increase in cyclosporine dosage when ketoconazole is discontinued. Concomitant administration of ketoconazole and tacrolimus may affect metabolism of tacrolimus resulting in increased plasma concentrations of the immunosuppressive agent. Ketoconazole and tacrolimus should be used concomitantly with caution. Renal function and plasma concentrations of tacrolimus should be monitored, and dosage adjustment may be necessary. Concomitant administration of ketoconazole and phenytoin reportedly may alter metabolism of one or both of the drugs, and serum concentrations of both drugs should be monitored if they are used concomitantly. Concomitant administration of ketoconazole and theophylline has resulted in decreased serum theophylline concentrations in a limited number of patients. Data from a study in healthy adults, however, indicate that single or multiple oral doses of ketoconazole may not substantially alter the plasma clearance of single IV doses of theophylline (as aminophylline). Pending further accumulation of data, serum theophylline concentrations and the patient should be monitored closely and theophylline dosage adjusted accordingly when ketoconazole is initiated or discontinued in patients receiving theophylline. Prolongation of the QT interval and QT interval corrected for rate (QTc), and rarely, serious cardiovascular effects, including arrhythmias (e.g., ventricular tachycardia, atypical ventricular tachycardia [torsades de pointes, ventricular fibrillation]), cardiac arrest, palpitations, hypotension, dizziness, syncope, and death, have been reported in patients receiving ketoconazole concomitantly with recommended dosages of terfenadine or astemizole, although these antihistamines are no longer commercially available in the US. Ketoconazole has markedly inhibited the metabolism of astemizole or terfenadine, probably via inhibition of the cytochrome P-450 microsomal enzyme system, resulting in increased plasma concentrations of unchanged drug (to measurable levels) and reduced clearance of the active desmethyl or carboxylic acid metabolite, respectively. Such alterations in the pharmacokinetics of these antihistamines may have been associated with prolongation of the QT and QTc intervals. Similar alterations in the pharmacokinetics of these antihistamines and/or adverse cardiac effects have been reported in patients receiving the drugs concomitantly with itraconazole, although in vitro data suggest that itraconazole may have a less pronounced effect than ketoconazole on the pharmacokinetics of astemizole. Therefore, astemizole and terfenadine have been contraindicated in patients receiving ketoconazole or itraconazole. It also has been recommended that these antihistamines not be used in patients receiving drugs that are structurally related to ketoconazole, including triazoles such as fluconazole, imidazoles such as miconazole (systemic preparations are no longer available in the US), and nitroimidazoles such as metronidazole. In a limited number of individuals receiving ketoconazole dosages of 200 mg twice daily, concomitant administration of a single 20-mg dose of loratadine resulted in a 302% average increase of loratadine's areas under the concentration-time curve (AUC), a 251% average increase in peak loratadine plasma concentrations, a 155% average increase of descarboethoxyloratadine's (an active metabolite of loratadine) AUC, and a 141% average increase in peak descarboethoxyloratadine plasma concentrations compared with those achieved in individuals receiving loratadine and placebo. No changes in the QTc intervals were reported 2, 6, and 24 hours after concomitant administration of the drugs and adverse effects were similar in individuals receiving loratadine concomitantly with ketoconazole and in those receiving loratadine and placebo. Concomitant administration of ketoconazole and methylprednisolone or prednisolone may result in increased plasma concentrations of the corticosteroid, possibly due to decreased clearance of methylprednisolone or prednisolone. Ketoconazole may enhance the adrenal suppressive effects of corticosteroids. Dosage adjustment of corticosteroids may be needed when ketoconazole is administered concomitantly with these drugs. Disulfiram reactions, including flushing, rash, peripheral edema, nausea, and headache, have occurred rarely in patients who ingested alcohol while receiving ketoconazole therapy but usually resolved within a few hours. Therefore, some clinicians recommend that alcohol be avoided during and for 48 hours after discontinuance of ketoconazole therapy. Concomitant administration of ketoconazole affects the pharmacokinetics of midazolam or triazolam resulting in increased peak plasma concentrations and prolongation of the plasma half-life of these benzodiazepines. Because increased plasma concentrations of the drugs may result in potentiated and prolonged hypnotic and sedative effects, midazolam or triazolam should not be used concomitantly with ketoconazole. Concomitant use of ketoconazole and triazolam is contraindicated. Special precaution is required if midazolam is administered parenterally to patients receiving ketoconazole because the sedative effect of midazolam may be prolonged with such concomitant administration. Elevated plasma concentrations of digoxin have been reported in patients receiving ketoconazole. Although it is unclear whether concomitant use of ketoconazole caused these increased concentrations, digoxin concentrations should be monitored closely in patients receiving the antifungal agent. Severe hypoglycemia has been reported when miconazole (a systemic preparation is no longer commercially available in the US) was used concomitantly with an oral sulfonylurea antidiabetic agent. Because ketoconazole is structurally related to miconazole, the manufacturer states that the possibility that this interaction could occur with ketoconazole should be considered. In vitro studies indicate that ketoconazole can inhibit the metabolism of paclitaxel. Although this potential pharmacokinetic drug interaction has not been evaluated in humans, the manufacturer of paclitaxel states that caution should be exercised when paclitaxel and ketoconazole are used concomitantly. Although there have been no reports to date of the acute toxicity associated with overdosage of ketoconazole, the manufacturer states that in the event of overdosage supportive measures, including gastric lavage with sodium bicarbonate, should be employed. Ketoconazole usually is fungistatic in action, but may be fungicidal at high concentrations after prolonged incubation or against very susceptible organisms. Like other azole antifungal agents, ketoconazole presumably exerts its antifungal activity by altering cellular membranes, resulting in increased membrane permeability, secondary metabolic effects, and growth inhibition. Although the exact mechanism of action of ketoconazole has not been fully determined, it has been suggested that the fungistatic activity of the drug may result from interference with ergosterol synthesis, probably via inhibition of C-14 demethylation of sterol intermediates (e.g., lanosterol). The fungicidal activity of ketoconazole at high concentrations may result from a direct physiochemical effect of the drug on the fungal cell membrane. In vitro, ketoconazole concentrations as low as 0.01 mcg/mL prevent Candida albicans from forming pseudohyphae. This effect enhances phagocytosis of the fungi when polymorphonuclear leukocytes are added to the cultures because the leukocytes can phagocytize yeast phase cells more easily than mycelial phase cells. Further study is needed to fully elucidate the effects of ketoconazole on steroid synthesis in humans, but the drug apparently directly inhibits synthesis of adrenal steroids and testosterone in vitro and in vivo. Ketoconazole appears to inhibit steroid synthesis principally by blocking several P-450 enzyme systems (e.g., 11b-hydroxylase, C-17,-lyase, cholesterol side-chain cleavage enzyme). Usual dosages (i.e., 200-400 mg daily) of ketoconazole have been reported to transiently (for 2-12 hours) inhibit testicular testosterone synthesis. A compensatory increase in serum luteinizing hormone (LH) concentrations may occur. Dosages of 800-1200 mg daily have been reported to have a more prolonged effect on testosterone synthesis; in one study in males receiving these high dosages, serum testosterone concentrations remained at a subnormal level (i.e., less than 300 ng/dL) throughout the day in about 30% of those receiving 800 mg daily and in all of those receiving 1200 mg daily. Oligospermia, decreased libido, and impotence often occurred in these males and azoospermia occurred rarely. Ketoconazole inhibits cortisol synthesis in a dose-dependent manner in individuals with normal adrenocortical function and in patients with Cushing's syndrome (hypercortisolism). In patients receiving ketoconazole, particularly those receiving relatively high dosages (e.g., greater than 400 mg daily) or divided daily dosing of the drug, the adrenocortical response to stimulation by corticotropin (ACTH) may be at least transiently diminished and urinary free and serum cortisol concentrations may be reduced. 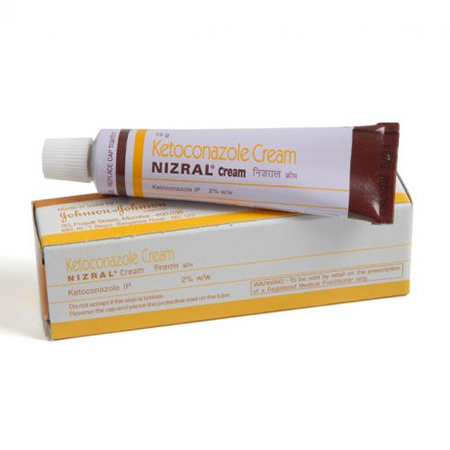 Spectrum Ketoconazole is active against most pathogenic fungi, including dermatophytes. The drug also has in vitro activity against some gram-positive bacteria, including Staphylococcus aureus, S. epidermidis, enterococci, Nocardia, and Actinomadura. Although the clinical importance is unknown, ketoconazole appears to have some in vitro activity against herpes simplex virus types 1 and 2 (HSV-1 and -2). In addition, limited in vitro studies indicate that ketoconazole may have some activity against protozoa, including Acanthamoeba and Leishmania and also may have some activity against chloroquine-sensitive and -resistant Plasmodium falciparum. Testing Results of in vitro ketoconazole susceptibility tests are method dependent, and MIC values vary substantially depending on the culture medium used, pH, the presence of serum, and the concentration of fungi used in the test inoculum. In addition, currently available in vitro tests may not necessarily reflect the in vivo susceptibility of some fungi (especially Candida). Optimal methods for antifungal agent in vitro susceptibility testing have been difficult to identify and are still being investigated. The National Committee for Clinical Laboratory Standards (NCCLS) has recommended standardized procedures for reference broth dilution antifungal susceptibility testing that can be used to test in vitro susceptibility of yeasts (e.g., Candida, Cryptococcus neoformans) to ketoconazole. The reference method has not been used for testing the in vitro susceptibility of the yeast forms of dimorphic fungi (e.g., Blastomyces dermatitidis, Histoplasma capsulatum) or filamentous fungi (e.g., Aspergillus, Pseudallescheria boydii, Rhizopus, Sporothrix schenckii). Criteria regarding specific MICs that would indicate in vitro susceptibility or resistance to ketoconazole are being established. Experience to date indicates that, when the NCCLS reference broth dilution procedure is used to evaluate susceptibility to ketoconazole, the majority of yeasts tested have MICs of 0.03-16 mcg/mL. However, data are not yet available to indicate a correlation between MIC and outcome of ketoconazole therapy. In vitro, ketoconazole concentrations of 0.1-2 mcg/mL generally inhibit most susceptible strains of Blastomyces dermatitidis, Coccidioides immitis, Cryptococcus neoformans, Epidermophyton floccosum, Histoplasma capsulatum, Malassezia furfur (Pityrosporum orbiculare), Microsporum canis, M. gypseum, Trichophyton mentagrophytes, T. rubrum, and T. tonsurans. Paracoccidioides brasiliensis is generally inhibited in vitro by ketoconazole concentrations of 0.002-0. mcg/mL. Ketoconazole concentrations of 1-25 mcg/mL generally are required in vitro to inhibit Actinomadura madurae, Aspergillus flavus, A. fumigatus, Nocardia, Petriellidium boydii, and Sporothrix schenckii. A wide range of ketoconazole MIC values has been reported for Candida. In some in vitro studies, the MIC90 of ketoconazole for C. albicans, C. glabrata, C. parapsilosis, and C. tropicalis was 0.125-16 mcg/mL; however, in other studies, these organisms required ketoconazole concentrations of 25 mcg/mL or greater for in vitro inhibition. When the NCCLS standardized procedure was used to test in vitro susceptibility of clinical isolates of C. dubliniensis obtained from patients with or without human immunodeficiency virus (HIV) infection, these strains were inhibited by ketoconazole concentrations of 0.03-0. mcg/mL. Some strains of C. lusitaniae are inhibited in vitro by ketoconazole concentrations of 0.03-0.12 mcg/mL. Exophiala castellanii has been inhibited in vitro by a ketoconazole concentration of 0.4 mcg/mL. Some strains of Scopulariopsis, including some strains of S. acremonium and S. brevicaulis, are inhibited in vitro by ketoconazole concentrations of 1-8 mcg/mL, but the MIC reported for other strains is greater than 16 mcg/mL. Limited in vitro studies indicate that ketoconazole concentrations of 6.25-10 mcg/mL may be amebistatic and concentrations of 25 mcg/mL may be amebicidal against Acanthamoeba. Resistance Strains of Candida albicans resistant to ketoconazole have been isolated from patients who received the drug. C. albicans resistant to ketoconazole may also be cross-resistant to other azole antifungal agents (e.g., fluconazole, itraconazole). 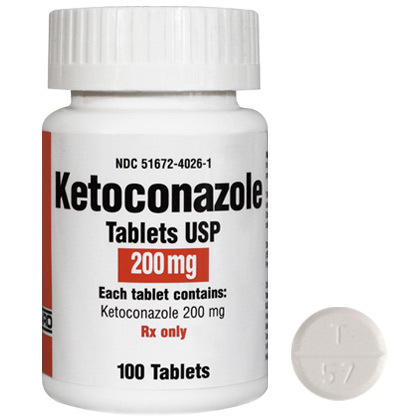 Ketoconazole is rapidly absorbed from the GI tract. In healthy, fasting adults, oral bioavailability of the drug is similar following administration of conventional tablets or a suspension but is somewhat higher following administration of a solution. Following oral administration, ketoconazole is dissolved in gastric secretions and converted to the hydrochloride salt prior to absorption from the stomach. The bioavailability of oral ketoconazole depends on the pH of the gastric contents in the stomach; an increase in the pH results in decreased absorption of the drug. Decreased bioavailability of ketoconazole has been reported in patients with acquired immunodeficiency syndrome (AIDS), probably because of gastric hypochlorhydria associated with this condition; concomitant administration of dilute hydrochloric acid solution normalized absorption of the drug in these patients. Concomitant administration of an acidic beverage may increase bioavailability of oral ketoconazole in some individuals with achlorhydria. In one cross-over study in healthy, fasting adults with achlorhydria (induced by administration of 60 mg of oral omeprazole 6-8 hours prior to ketoconazole), the peak plasma concentration and area under the plasma concentration-time curve (AUC) of the drug averaged 0.8 mcg/mL and 3.46 mcg/mL per hour, respectively, when the dose was administered with 240 mL of water and averaged 2.44 mcg/mL and 11. mcg/mL per hour, respectively, when the dose was administered with 240 mL of Coca-Cola Classic (pH 2.5). Concomitant administration of drugs which increase gastric pH may decrease absorption of ketoconazole. (See Drug Interactions: Drugs Affecting Gastric Acidity.) The effect of food on the rate and extent of GI absorption of ketoconazole has not been clearly determined. Some clinicians have reported that administration of ketoconazole to fasting individuals results in higher plasma concentrations of the drug than does administration with food. However, the manufacturer states that administration of ketoconazole with food increases the extent of absorption and results in more consistent plasma concentrations of the drug. The manufacturer suggests that food increases absorption of ketoconazole by increasing the rate and/or extent of dissolution of ketoconazole (e.g., by increasing bile secretions) or by delaying stomach emptying. In healthy, fasting adults, peak plasma ketoconazole concentrations of approximately 4.2, 5, or 6.2 mcg/mL occurred 1-2 hours following oral administration of a single 200-mg dose as tablets, a suspension, or a solution, respectively. Following oral administration of a single 200-mg dose of ketoconazole as tablets to nonfasting adults in another study, peak plasma concentrations of the drug were attained within 1-4 hours and ranged from 1.5-4. mcg/mL; plasma concentrations of the drug were usually less than 0.05 mcg/mL after 24 hours. In one study in adults, a single 200-mg dose of ketoconazole as tablets given with a meal resulted in average plasma concentrations of the drug of 3.2 mcg/mL at 1 hour, 2.4 mcg/mL at 2 hours, 1.2 mcg/mL at 4 hours, and 0.6 mcg/mL at 6 hours.In one study in a limited number of children 4-12 years of age, a single 100-mg oral dose of ketoconazole as tablets resulted in plasma concentrations of the drug ranging from 0.6-2.5 mcg/mL 2 hours after the dose. Oral bioavailability of the drug was increased substantially when ketoconazole was administered to children as a suspension rather than as crushed tablets mixed with applesauce; peak plasma concentrations also were higher and occurred sooner with the suspension. Considerable interindividual variations in peak plasma concentrations attained and areas under the concentration-time curves (AUCs) have been reported with a specific oral dose of ketoconazole. In one cross-over study in adults who received single oral doses of ketoconazole of 100 mg, 200 mg, and 400 mg, a comparison of dose versus AUC suggested that ketoconazole undergoes saturable first pass elimination since bioavailability of the lower dose was relatively poor. Ketoconazole has been detected in urine, bile, saliva, sebum, cerumen, synovial fluid, and CSF following oral administration of a single 200-mg dose of the drug in adults. 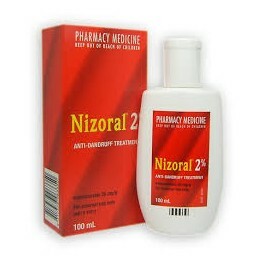 CNS penetration of the drug is unpredictable and has generally been considered to be minimal. In 2 adults with meningitis caused by Coccidioides immitis, a single 400-mg oral dose of ketoconazole resulted in CSF concentrations of the drug of 0.14 mcg/mL and 0.21 mcg/mL 4 hours after the dose; serum concentrations of ketoconazole in these patients were 2-4 mcg/mL 1-2 hours after the dose. In one study in adults with inflamed meninges, CSF concentrations of ketoconazole ranged from 0-0.24 mcg/mL at 1-2 hours after a single 200-mg oral dose of the drug and 0-0. mcg/mL at 1-3.5 hours after a single 400-mg oral dose of the drug. In several other adults with coccidioidal CNS infections, lumbar CSF concentrations of ketoconazole averaged 0.25 mcg/mL at 8 hours after an 800-mg oral dose and ranged from 0.27-1.65 mcg/mL at 4 hours after a 1.2-g oral dose; ventricular CSF concentrations averaged 50-60% of those attained in lumbar CSF. In rats, highest concentrations of ketoconazole are attained in the liver, pituitary, and adrenals; moderate concentrations are attained in the lungs, kidneys, bladder, bone marrow, teeth, myocardium, and various glandular tissues; and lowest concentrations are attained in the brain and testes following a single oral dose of the drug. It is not known if ketoconazole crosses the placenta in humans; however, the drug crosses the placenta in rats. Ketoconazole is distributed into the milk of dogs and is probably distributed into human milk. Ketoconazole is 84-99% bound to plasma proteins, primarily albumin. Plasma concentrations of ketoconazole appear to decline in a biphasic manner with a half-life of approximately 2 hours in the initial phase and approximately 8 hours in the terminal phase. Preliminary data indicate that plasma concentrations and half-lives of ketoconazole are not substantially affected by renal or hepatic impairment; however, further studies are needed before the effects of renal and/or hepatic impairment on the pharmacokinetics of the drug can be adequately evaluated. Ketoconazole is partially metabolized, in the liver, to several inactive metabolites by oxidation and degradation of the imidazole and piperazine rings, by oxidative O-dealkylation, and by aromatic hydroxylation. The major route of elimination of ketoconazole and its metabolites appears to be excretion into the feces via the bile. In one study in fasting adults with normal renal function, approximately 57% of a single 200-mg oral dose of ketoconazole was excreted in the feces within 4 days; 20-65% of this was unchanged drug. In the same study, approximately 13% of the dose was excreted in urine within 4 days; 2-4% of this was unchanged drug. Ketoconazole, a synthetic azole antifungal agent, is an imidazole derivative structurally related to other imidazoles (e.g., butoconazole, clotrimazole, econazole). Ketoconazole occurs as a white to slightly beige powder and is practically insoluble in water. Ketoconazole has pKas of 2.9 and 6.5. Ketoconazole tablets should be protected from moisture and stored in well-closed containers at 15-25°C.